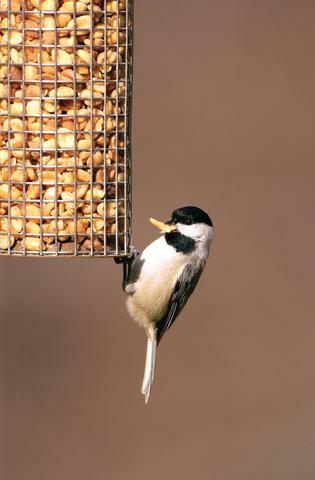 Wild Birds Unlimited: Why Do Birds Like Peanuts? Why Do Birds Like Peanuts? The greater variety of foods you offer, the more your birds will enjoy visiting your yard. Did you know that a lot of birds like peanuts? Nuts at the feeders attract some of the most interesting birds. The crazy antics of the woodpeckers, titmice, chickadees and nuthatches alone make it worthwhile to try feeding peanuts. The peanut probably originated in South America and spread throughout the New World as Spanish explorers discovered the peanut’s versatility. It's a high fat, high protein food that makes a very nutritional treat. In fact peanuts are so popular with birds that several feeders have been invented for just peanuts. And I especially like the birds that come to my peanut bells. Wild Birds Unlimited - East Lansing also offers four seed blends that have peanuts. Even our most popular no-mess blend has peanuts in it to attract cardinals, titmice, jays, chickadees, wrens, woodpeckers, robins, nuthatches and more. Whether it's straight peanuts, peanut bells, peanuts in a seed blend or even peanut butter suet, it's fun to watch the birds attack feeders with peanuts. I have always assumed (you know what they say about assume!) is that small birds utilize the high fat content in peanuts. It represents a high energy food that can quickly be utilized. Sunflowers are a little more native and do provide essential fats and oils as well. My first time at your blog and I really liked it. I will be sure to return, keep up the good work!